If this is the first you’ve heard about our AVR Programming series, head back to Part 1 and start from the beginning. Otherwise, take a deep breath and we’ll being after the break. 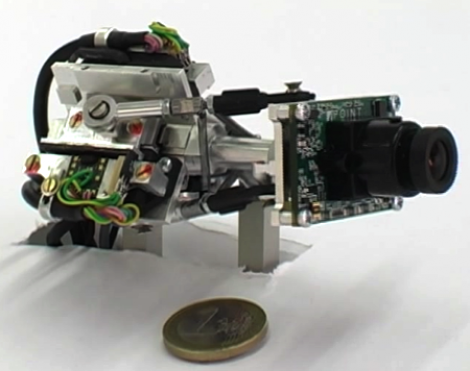 This robot eye can move five times faster than the human eye. It’s capable of being used to follow a human gaze and, as you can see by that coin, it’s small enough to be used in pairs. When used to follow your gaze it needs a custom-made eye tracker. The thought here is that a lot can be learned about a person’s psyche by monitoring what they are focusing on. But we wonder about the augmented reality properties of a setup like this. Imagine a pair of glasses as a heads up display. If this camera knows where you’re looking it can process the items in your gaze and overlay digital information. As with all new technology there are obvious military uses for this, but we’d be more interested in a Flickr pool type collection of people’s real-world experiences. Like subscribing to the locations of that thumb drive network in NYC and having the camera/glasses guide you to the nearest installation. Want to see how fast this thing responds? Check out the video after the break. Can Super Mario teach you to think? That’s the idea behind using a simple version of the game to teach artificial intelligence. 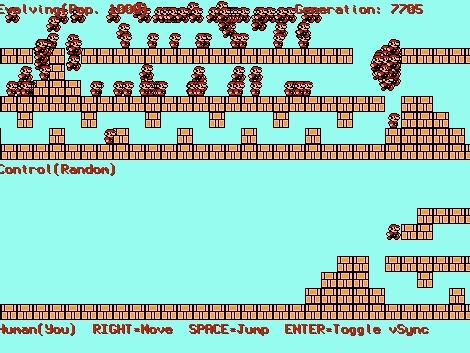 [Oddball] calls this The Mario Genome and wrote at program that can take on the level with just two controls, right and jump. He gave the script 1000 Marios to run through the level. It then eliminates the 500 least successful and procreates back to 1000 using the 500 most successful. In this way the program completed the level in 1935 generations and completed it in the quickest possible time in 7705 generations. He’s posted the script for download so that you can try it yourself. It’s an interesting exercise we’d love to see applied to more random games, like Ms. Pac-Man. [Mikey Sklar] finds himself in need of a temperature regulated refrigerator for fermenting foods like yogurt, kimchi, bread, and beer. After some testing he found that by building his own controller he can get a chest freezer to outperform an upright refrigerator at this task by 2-to-1. The controller is based around an ATmega48. 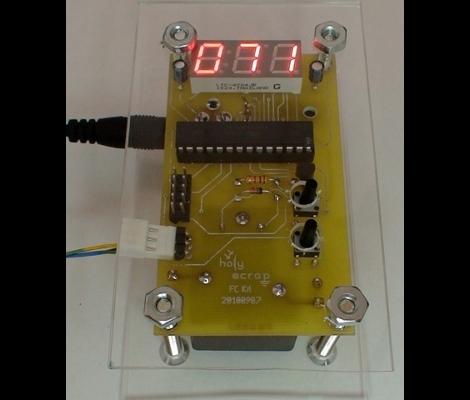 It includes a remote temperature sensors which you can see connected to the lower left header in the image above. On the back of the board there’s a relay used to switch the freezer’s power on and off. [Mikey] is selling a kit but the hardware and software for the project are both open source so build it yourself if you have the know-how. A chest freezer is a great place to store Cornelius kegs… we’ll keep our eyes open for one. [Jeri Ellsworth] is back at it again. We seem to cover her work a lot here. Her latest video above covers how she created a point contact transistor from a 1N34 germanium cat whisker diode. After opening the glass casing on the diode, she uses sharpened phosphor bronze metal from common electrical connectors as the collector and emitter. A 330 microfarad capacitor charged to 20 volts and then discharged though a 680 ohm resistor to the base and collector leads forms the collector region. Her test jig is a simple oscillator circuit such that a properly formed transistor will start the circuit oscillating and make and audible sound. We look forward to more esoteric knowledge of electronic devices being brought to our attention. [Lyscho] built a racing simulator cockpit based on a PVC frame but it took up a lot of space when not in use. His second generation is built inside the frame of an ottoman, meaning it can be stored right under your feet. The pedals are fixed in place, with some padding below to rest your heels on. The cockpit chair and steering wheel are both adjustable to suit different drivers. They use a routed groove along with wing nuts and bolts, making it easy to slide them for adjustments. The ottoman itself is [Lyscho’s] own creation, which just needs power and USB when in use, and has a padded top when not in use. 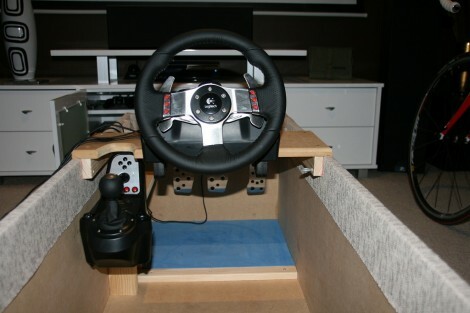 If you can’t use a real car as the simulator this is fantastic alternative. Have you ever wanted to be on (Internet) TV? Are you an independent inventor? It might just be your lucky day. The fine folks at Independent Inventor TV, a new show currently filming for Revision3, is looking for home and garage based inventors to present their inventions for the camera. Currently they are based out of San Francisco, CA and are looking to film people in person, or by Skype if you are out of town. To apply to be on the show, send an email to Independent.Inventor.tv(at)gmail.com with the details, photos, and videos of your inventions. The shooting date of the show is November 15th, so make sure to have all submissions in well before then. The selected inventors will get to meet the hosts, Comedian Jonah Ray, as well as fellow hacker [Joe Grand] (who is the creator of many of the DefCon Badges we have covered before). Be sure to let them know Hackaday sent you!